As part of Pennsylvania’s Inspired Leadership (PIL) program, as a principal I have the opportunity to participate in professional development sessions offered through the National Institute for School Leadership. I’m now involved in the fourth and final course of the program, which includes three units: The Principal as Driver of Change, Leading for Results, and a culminating simulation. Another potential beneficial aspect of these sessions is the ability to network with other principals and administrators in our local area. The most meaningful time in our days of coursework came when we were given the opportunity to talk, at length, with our colleagues. Not all sessions are designed in this fashion, and in far too many we were being “spoken to” rather than actually involved in the conversations. While the curriculum itself was designed with a purpose, in some sessions, the needs of the participants clearly varied greatly than what was delivered. (Evident by audible sighs and grumblings.) On those days, most of us were busting at the seams to talk to one another about actual situations we were experiencing, roadblocks we were encountering, and just reaching out for a general sense of support from someone in our role who “gets it.” Just this week I had the chance to talk about the Daily Five with another elementary principal who was looking for a literacy framework for her school. She had never heard of it, and without the opportunity to discuss ideas with one another, she would have left the session not knowing it existed. In my first few courses, taken about two years ago, we were given strict instructions to “power down.” That, obviously, didn’t go over well with me, or the other 30 principals in the room who were out of their buildings during the school day and who felt a need to be connected to their buildings. For me, I obviously wanted the immediate access to information. If a facilitator mentioned a great book I should read, I was forced to write the title down on the side of a piece of paper located in my ginormous binder of resources (the contents of which are difficult to easily reference and share with others) rather than quickly access it on Amazon and add it to my wish list or add it to my Shelfari list. After that first adamant directive: “Turn off your devices, folks,” I was brutally honest when completing the session evaluation that afternoon. The devices give us access to information; some people learn very effectively in that manner; we’re principals whose schools are in session and our people need to be able to contact us; oh, yeah, and WE’RE ADULTS. Day 2? They changed their tune. “We understand some of you might use your devices to take notes or access information, so you may use them, just please be respectful of others in the group.” There’s an idea. On subsequent evaluations I always mention the need for a course that includes learning about the role of the connected educator and the need for skills in networking and familiarity with technology and innovative teaching and learning practices. In one session I was given 15-20 minutes at the end of the day to promote the use of social networks in education, and from that talk I convinced a handful of folks to give Twitter a try and work to update some of their school communications. But even this past week, when asked by the facilitator, “Who among you are using social media for the task of communicating with parents and staff?” (the thought of using it for professional growth wasn’t even mentioned), my hand raised, and after my explanations I again answered questions about safety, fear regarding negative comments on blogs, etc. I’m not surprised, considering the facilitator began her social media discussion by sharing how 9th graders in her school used Facebook to coordinate an end-of-the-year food fight, and it was clear the majority of the blame fell on the tool, not the individuals involved. So, on one hand, the NISL folks are telling us how the US is lagging behind other countries in so many areas of educational performance, including global awareness, and on the other hand, many facilitators admonish the use of the tools that can GET US CONNECTED. We leave the sessions, the only connection we have to one another are our shared conversations and a mass email list that goes out to remind us of the session assignments and location. There would be great benefit in developing an online, interactive portal in which participants could network. One time, we tried setting up a cohort wiki, but it didn’t take. I understand there’s a tremendous cost involved to the state for funding this type of professional development for administrators, and perhaps therein lies the problem. We’re neglecting the use of the free and on-demand tools that can connect us together in learning. Great post Lyn, I think the point you make here is critical, the more connected we are as instructional leaders – the less we need this type of formal professional development. This is exactly why I am attending Edcamp Leadership, I know there, the entire day will be focused on conversation and sharing between practicing school leaders. This is also the exact reason whey I stopped pursuing my doctorate degree as I wrote about in my blog. The gains I have made in the last 2 years as a leader have come primarily through the connections I have made with others across the world via social media and real conversations, not sitting in institutes. In fact, what I look forward to most when I do attend conferences is connecting with those people that I have been fortunate enough to connect with first online. 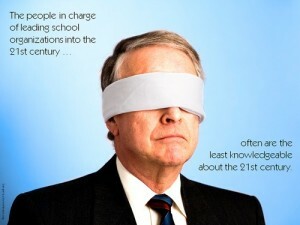 There certainly can be value in formal conferences and institutes, but for them to expect you to disconnect to learn in a vacuum is completely at odds with what we should be leading in our schools. Hi, Jason, thanks for commenting. I’m looking forward to Edcamp Leadership, and I’m imagining I’ll reflect upon the differences between that event and traditional PD offerings for administrators. I definitely think I’ve learned a lot of valuable information through NISL, but too often, like you said, it exists in a vacuum. I’ve followed through with more learning/instituted ideas in my school from my PLN than with most traditional PD. Lyn, I couldn’t agree more. I am a vice principal in a private high school in NE Philadelphia. Not all of our administrative team agrees about the benefits of social media or collaborative efforts. I sometimes find myself starving for collaborative educational leadership opportunities. The education profession is no longer one of keeping your ideas within your classroom or school. It is all about sharing ideas to better the education for all students. Thank you for sharing. Monica, thanks for commenting. I can’t imagine being part of a large admin team and not having the chance to collaborate. I’m spoiled in that our admin team is very small and we have many face-to-face opportunities to work with one another, but in a large district, that’s definitely not the case. Keep promoting the use among your colleagues… it will eventually make an impact! Great post! I agree with everything you stated. I joined twitter a little over a year ago and have found it to be an incredible source of PD. Having access and networking with administrators from around the world has broadened my insight into education. This fall I have required all my staff to have a twitter account so that we can use it as a means of communication. I have found that now that my staff has been “gently nudged” into using it regularly some are starting to use it to share PD. I know as the fall moves along more and more staff will utilize the power of this tool. Sometimes as educational leaders we need to move our people past the resistance they’ve created from the negative information they’ve been exposed to. I have found that many staff look at things they are unfamiliar with in a negative way until they exposed to it. Thanks, Darran. Great idea encouraging the use of Twitter with your staff. I did the same, and while initially the interest was high, only those who put the time in to develop a solid network, give back, and participate authentically found real meaning in its use. THAT’S the trick! I think sometimes people assume the social media tools are going to do the work for them. It doesn’t work like that in any other scenario, so why would it work with Twitter? Definitely share the great things you’ve been learning/exposed to and demonstrate how it can positively impact their practice and work with kids! Thanks for sharing! Well stated, Lyn. I love the paragraph below! Hi, Scott, thanks for sharing those slides! Your story is powerful! I recall an early literacy training some teachers and I attended this past fall. We were the only team there with laptops, sitting around the table! As the presenter began with loads of PowerPoint slides (some of them had links referenced – so I’m supposed to type 45 characters into my browser to access?! ), I could see the life draining out of my teachers! We started a shared Google doc and began compiling resources related to the early lit topics and using the chat features to discuss how the topics impacted our work with kids at our school. By the end of the day, we created a valuable resource we shared with other staff back at our school! Isn’t your experience a function of a need to change the learning space of professionals just as we are for students. It is so frustrating that I am asked to give a talk at a conference about the future of education…and expected to talk AT people for 45 minutes, as if they will gain real knowledge from that! This is driven by two things: inertia (we all know the pain of change) and vested interest of the consultants who still wish us/you t believe they are the repository of the knowledge you seek. I am now demanding that any conference I speak at gets away from sit-and-listen and focuses on leveraging the neural network that is in the room at the time; out of the seats and into the connected work zone. Just like we want for our students! Hi, Grant, thanks for sharing! Yes, I think that while, as adults, we are able to sustain longer periods of being “talked at,” it shouldn’t mean we have to. There are plenty of opportunities for collaborative team work during PD sessions, and I’ve started to see more of that emerge. I know that at our school, we prefer not to have any PD operate in that manner unless completely necessary. (And sometimes it’s out of our hands, like when outside consultants come in, which isn’t very often.) I think it’s great that you make your participants aware that they will be expected to be active learners in the process! And yes, it’s a matter of modeling the behaviors we want to see in our classrooms! Nice post Lyn. Throughout this summer, I have attended many workshops and conferences in which I have experienced much of the same. Today I attended a training on Teacher/Leader Effectiveness (our new teacher evaluation model). The presenters, according to the rubric , would have received an “Unsatisfactory” rating from my perspective. Ha! We are attending a similar training in a few weeks… I am anxious to see how it goes. I am hoping that, at least, we will be permitted to use our devices throughout the day. I especially consider all of the things I could be researching and preparing for the coming year in relation to the content of that type of training. Thanks for your comments! Great post Lyn. It blows me away the resistance I have already experienced to the use of social media and “connectedness” in my very short time as an AP. Changing the culture is tough, but is possible! Thanks for setting the example! The initial resistance is definitely fear-based, at least in my experience working with admin. and teachers. It takes some time for them to get over that, see the real benefit, and begin to plan how to use the tools effectively to enhance communications and promote more collaborative opportunities in their schools. I have never heard of an administrator who made “the shift” and returned to traditional ways of doing things. I couldn’t imagine only sending home a paper newsletter every month! Thanks for commenting!